Llias Wonch of Gandy, NE and Alasha Johnson of Arnold, NE opened the Hoffman Ranch bull sale with the National Anthem. Photo by Terri Licking. The National Western Champion Carload of Hereford bulls was a sale highlight at the Hoffman Ranch bull sale. 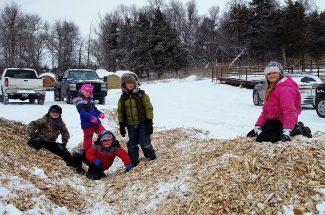 The next generation of Sandhills Ranchers enjoyed a snow day from school and came to the Hoffman Ranch sale. Photo by Terri Licking. 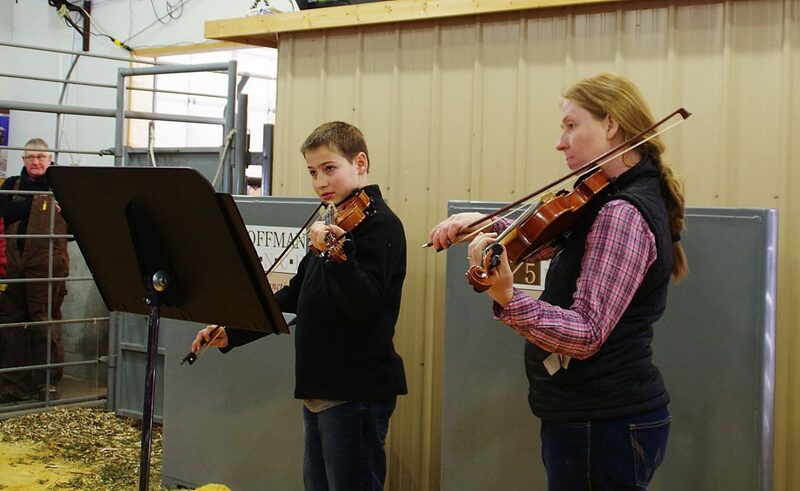 A fast moving snow storm put a chill in the air for the Hoffman Ranch Annual Bull Sale, but that didn't slow down the bidding on a great set of Hereford and Angus bulls. Lot 13, $60,000, H Cuda 7934 ET, PLD, DOB: 8/9/2017. SIRE: BEHM 100W Cuda 504C; MGS: NJW 98S R117 Ribeye 88X ET. Sold to Genoa Livestock, Minden, NV. Lot 3, $50.000, H Pilgrim 8426 ET, PLD. DOB: 2/14/2018. This bull was a member of the Denver Carload. SIRE: Churchill Pilgrim 632D ET: MGS: RST GAT NST Y79D Lady 54B ET. 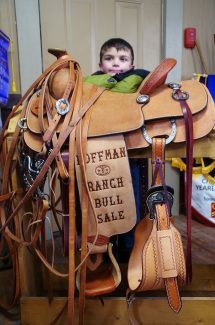 To Buck Cattle Co., Madill, OK. Lot 207, $37,500, H FHF Outcross 810 ET, PLD. DOB: 4/16/2018. SIRE: Golden Oak Outcross 18U; MGS: CJH Harlan 408. Sold to Williams Hilltop Herefords, Rushford, MN & Rocking G Land & Cattle, Gull Lake, SK. Lot 15, $36,000, H GAT NST Sensation 7968 ET, PLD, DOB: 9/6/2017. SIRE: UPS Sensation 2296 ET; MGS: WORR Owen Tankeray Y78D ET. Sold to Torrance Herefords, Media, IL. Lot 17, $30,000, H Cuda 7943 ETR, Polled. SIRE: BEHM 100W Cuda 504C; MGS: NJW 5139 R117 Ribeye 88X ET. He sold to Bowling Herefords & Red Angus, Blackwell, OK. Lot 6, $27,000, H GAT NST Cowboss 4F ET, DOB: 2/15/2018, SIRE: NJW 78P 88X Cowboss 199B ET; MGS: WORR Owen Tankeray Y79D ET. To Kroupa Cattle, LLC, Pukwana, SD. Lot 5, $26,000, H Hometown 8439 ET, PLD, DOB: 2/18/2018, SIRE: NJW 135U 10Y Hometown 27A; MGS: WORR Owen Tankeray Y79D ET. Sold to Upstream Ranch, Taylor, NE & Dvorak Herefords, Lake Andes, SD. Lot 57, $25,000, H GAT NST Sensation 7967 ET, PLD, DOB: 9/3/2017. SIRE: UPS Sensation 2296 ET; MGS: WORR Owen Tankeray Y79D ET. To Kroupa Cattle, LLC, Pukwana, SD. Lot 287, $26,000, Hoffman Cowboy Up 8491, DOB: 3/8/2018. SIRE: HA Cowboy Up 5405; MGS: S A V 8180 Traveler 004. He sold to Kroupa Cattle, LLC, Pukwana, SD. Lot 255, $22,500, Hoffman Cowboy Up 7792, DOB: 8/15/2017. SIRE: HA Cowboy Up 5405; MGS: McKellar Final Call. Sold to Vin-Mar Cattle Company, Clinton, NE. Lot 368, $20,000, Hoffman Sensation 803, DOB: 1/14/2018. SIRE: S A V Sensation 5615; MGS: S A V Brilliance 8077. Sold to Bar H Land and Cattle Company, AB CN. Lot 251, $17,500, Hoffman Cowboy Up 7832, DOB: 8/23/2017. SIRE: HA Cowboy Up 5405; MGS: Sitz Upward 307R. He sold to La Santina de Agrofin – Argentina. Lot 284, $12,500, Hoffman Cowboy Up 8348, DOB: 1/24/2018. SIRE: HA Cowboy Up 5405; MGS: S A V 004 Density 4336. He sold to Kroupa Cattle, LLC, Pukwana, SD.